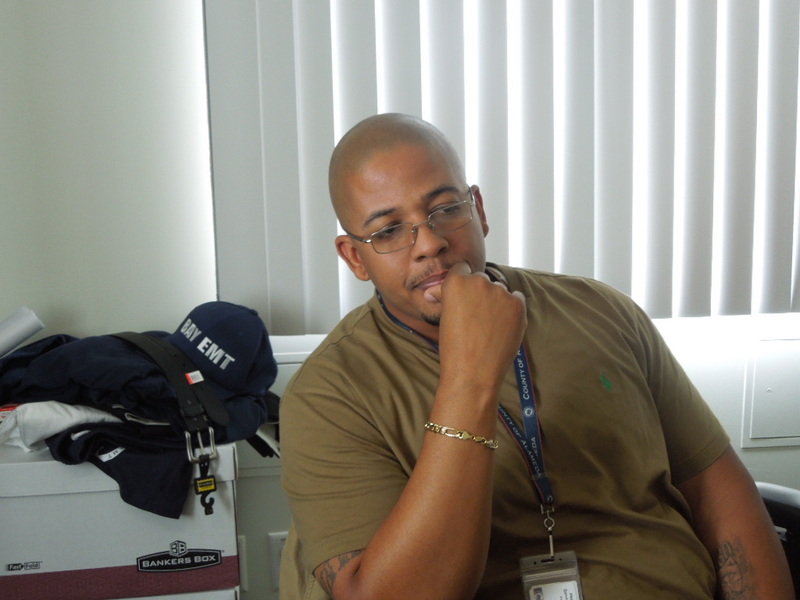 “I have a passion for juvenile justice,” says Michael Gibson, Program Director of EMS Corps. 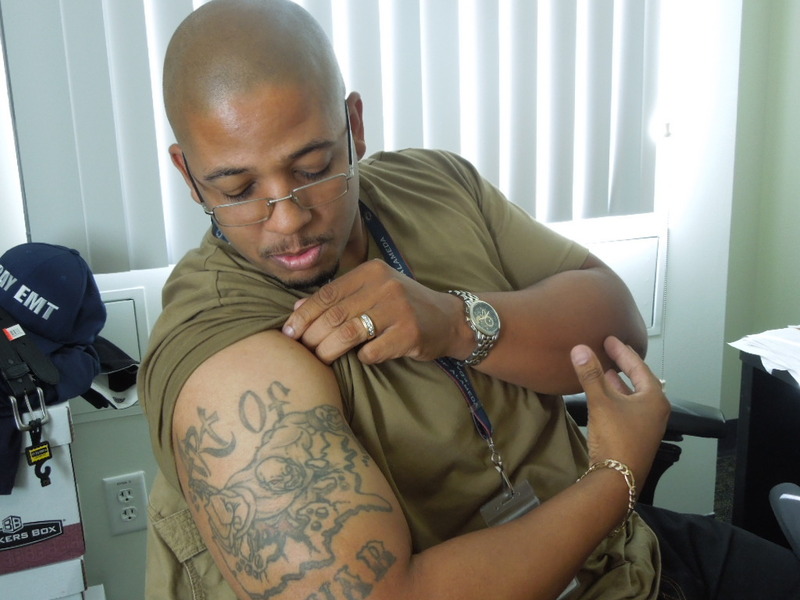 Gibson, a baby-faced six footer with large tattoos across his arms, settles his sturdy frame in his office chair at Alameda County Public Health, where he has served for the past three and a half years as the Program Director of Emergency Medical Services (EMS) Corps – a youth development, mentorship and training program in medical healthcare. 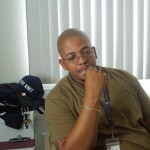 He has also worked as a case manager at Youth Uprising – an East Oakland organization serving at-risk youth – where he created and lead a group for young men to discuss spirituality, violence-prevention, and mentorship. Gibson’s dedication to guiding young people away from the street and towards more productive lives comes from hard lessons he learned as a young man, trying to be one of those street stars. The second oldest of four siblings, Gibson grew up in Deep East Oakland during the 80’s crack epidemic. His parents struggled with their own addictions. That’s where he first got exposed to drugs and dealers – they were both a constant presence in the house. Gibson was raised by his grandmother who worked long hours as an in-home care nurse. With only her limited income to support him and his brothers, Gibson says he felt an obligation at a young age to contribute to the household financially. So he did what he knew. There was the glossy facade of disposable income, expensive clothes, cars, and sneakers – the life of a drug dealer. There was practically an open invitation to that non-exclusive club. To join, all you needed was a gun. Photo by Sabirah Mustafa Oakland Voices 2012. Any luck Gibson had ran out during his incarceration at CYA, when he participated in a riot in which an officer was assaulted. He was punished with nearly a year in solitary confinement. “Life wasn’t easy in solitary,” Gibson admits. He got some reprieve when CYA offered him the African American Male Transition Program, which provides personal transformation and life skills for young offenders. 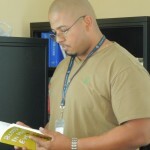 AAMTP was created by Wade Nobles – an academic noted for his work in African psychology – and it emphasizes manhood development and spirituality. The program’s principles were designed to develop inner strengths through self-purpose, education, and conflict resolution. There were also African-American male community leaders and role models who provided living examples of excellence. 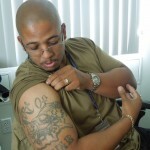 Sun Tzu’s, “The Art of War”, tattooed on Gibson’s arm, reveals Tzu’s profound influence. He got that, and much more. As a result of Gibson’s participation in the program, his time in solitary confinement was reduced. A man he calls Coach – an elder at the Omega Boys Club and an AAMTP mentor – introduced Gibson to Sun Tzu’s iconic book of military strategies, The Art of War. Gibson says that book shifted his outlook, made him more open to AAMTP’s principles, and helped him endure his remaining time at CYA. He earned his GED while he was locked up, and at age 19, the eighth-grade dropout was finally released. Back in his old neighborhood and on parole, he had to make wiser choices than he had when he was a street star delinquent. Soon after his return home, his female cousin was brutally assaulted. Instead of following his male relatives on a revenge mission, Gibson held back and called one of his mentors for guidance. “I didn’t want to be in the life anymore,” he says. That intervention shaped Gibson’s decision to attend Laney College and stay out of trouble. He eventually received a scholarship from the Omega Boy’s Club to attend Morehouse College where he graduated in 2006 with a degree in English and Drama. Gibson browses “Blood in My Eye,” by prison revolutionary, George Jackson. 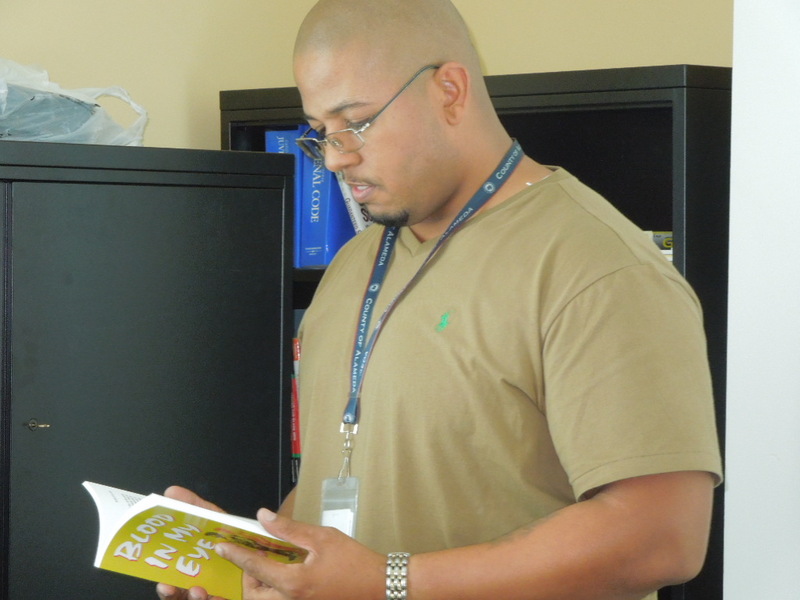 A powerful book he read while incarcerated. AAMTP molded Gibson’s ceaseless commitment to community service. The program taught him to appreciate his black community and culture, and to respect himself as an African American man – values he says teachers and colleagues in the past had encouraged him to discard. Like Sankofa – the mythical bird in West African culture that symbolizes going back to retrieve things lost in order to move forward – Gibson also had to go back and reconnect, while he was incarcerated, with his own history. He regularly draws on his past struggles to help him improve his life, and those of others. 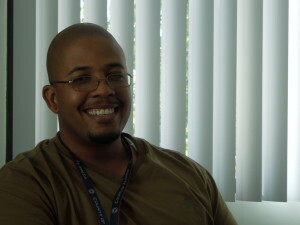 Through the African American Male Transition Program, Gibson had a chance to explore spirituality. After his release, he continued to study the religious traditions of Nigeria’s Yoruba culture. In 2007, he was initiated into the Yoruba priesthood. Closer to home, Gibson’s growth as a mentor and spiritual healer has taken him full circle.